While traveling with the Cubs in California, Reagan took a screen test in 1937 that led to a seven-year contract with Warner Brothers studios. He spent the majority of his Hollywood career in the "B film" division, where, Reagan joked, the producers "didn't want them good, they wanted them Thursday." 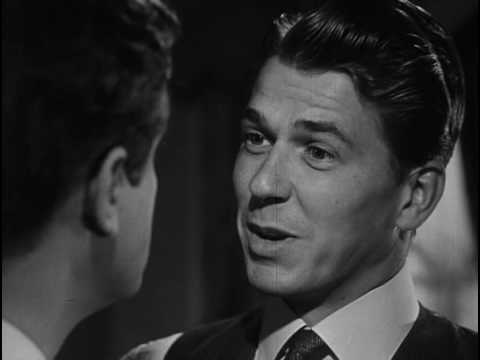 While often overshadowed by more famous actors, Reagan's films did receive many good reviews. In the spring of 1937, Reagan accompanied the Chicago Cubs to their spring training camp in southern California, a trip he arranged in order to explore a possible movie career. His good looks and confi-dent manner attracted the attention of an agent, who set up a screen test for him with Warner Brothers. The studio was impressed with Reagan and offered him a seven-year contract starting at $200 a week—many times his salary in Des Moines. Reagan promptly accepted. Six months later, he brought his parents to California to live with him.